Why Does the Government Keep Supporting Air India? » Airlines' joyride coming to an end? 2007 was a year of new experiences for me. In December, I got married. And a few months earlier, in April, my sister and I went on our first international holiday. The destination: London. Boy were we excited! After days of relentless planning, booking the hotel, securing visas, and getting the itinerary in shape, the day of departure finally dawned. Happy as larks, we headed to the airport. Completed all the routine procedures. And then we were ready to board. All was well so far. Little did we know that shortly we would be in for a rude shock. The airline we had opted for, you see, was Air India. Once we boarded the plane, we were told that some technical difficulties had surfaced. These are being sorted out. And while the plane would not take off at the designated time, we were assured that it would as soon as possible. My sister, who promptly went to sleep as soon as we boarded, woke up six hours later. She looked out of the window and gasped. 'What! We are still in Mumbai?' she screamed. Her frustration was palpable. We should have been more than half way across the ocean already. The delay ultimately lasted eight hours before the plane took off. There was considerable drama before that as many disgruntled passengers vented their ire at the airline. My sister and I vowed never to fly Air India again. Even if that meant paying a premium for the other airlines. It is a resolution that has stood us well till date. The sad thing though is that my bad experience with Air India is hardly unique. Passengers are always reporting terrible experiences with the airline. Then there are crew problems: pilots going on strike, overworked crew members, regular mishaps that do not happen at any other airline. But the biggest problem that the airline is grappling with? Accumulated losses that just keep piling on. All of these factors are obviously interlinked. It amazes me that the airline continues to run. Indeed, the government seems to be having some sort of a death wish as it keeps pumping money into what is clearly a lost cause. Indeed, it's a topic that greatly interests Vivek Kaul too. As you would know, Vivek Kaul is the editor of Vivek Kaul's Diary, and he has written on the sorry state of affairs at Air India. In 2015-16, Air India made a net loss of Rs 2,636 crore. This means that between 2010-11 and 2015-16, the airline has made a total loss of Rs 34,689.7 crore. And that is not a small amount by any stretch of imagination. Given the loss of Rs 2,636 crore, this means that the government would have had to pour money into Air India in 2015-16. In fact, until March 2016, the government had already poured Rs 22,280 crore into Air India. For 2016-17, an equity infusion of Rs 1,713 crore has already been approved. The only reason why the net loss reduced in 2015-16 was because of lower oil prices. And this is something beyond the government's control. Which means that once oil prices start rising again, the losses will start rising too. Indeed, Vivek strongly believes that Air India is a symbol of all the taxpayer money that the government wastes to keep loss-making public sector enterprises going. Air India is just one example. There are several such perpetually bleeding PSUs both listed and unlisted. Vivek has written an eye-opening piece on another such entity - MTNL. According to him, both these examples in part highlight India's debt bubble, which keeps getting bigger and bigger. The government keeps talking about how India is growing and it is the fastest-growing economy in the world. But it is not telling you the whole story. You deserve to know what's really going on. And Vivek wants to tell you all. In fact, he has something big on his mind. You see, he is very keen to expose these government lies. Trust me, you don't want to miss this. I can't go into the details just yet. But all will be revealed soon. Watch this space. Have you ever had a terrible experience with Air India? Let us know your comments or share your views in the Equitymaster Club. Talking about airlines, indeed, they have been having a jolly good time due to the fall in oil prices. Take India's second largest airline Jet Airways for example. It recently reported a fourth straight quarter of profit. Now this is a big deal for the airline. That's because this is the first ever annual profit for Jet! Talk about a tricky business! Nonetheless, Jet and the others have benefited from the lower crude oil prices that have been prevailing. This lowers fuel expenses, which make up a large 40% or so of their total costs. Airlines' joyride coming to an end? And promptly enough, shares of aviation companies such as Jet Airways, InterGlobe Aviation etc fell upto 4% yesterday. 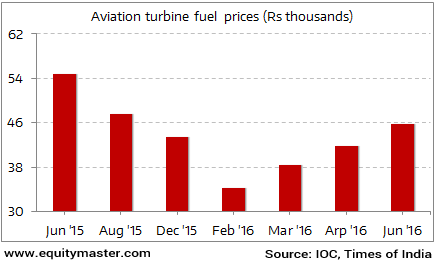 If this trend continues, perhaps we're looking at another gaping hole in Air India's P&L for FY17. Equipped with a tablet or a smart phone, the humble post man may soon also double up as your banker. The Union Cabinet has cleared a proposal to set up a postal bank. This will mean that with technology as the enabler, the postman will begin providing a host of financial services at one's doorstep. This could include basic banking services like opening current/savings accounts to making payments like social security, remittances and for financial products like insurance, mutual funds etc. The government has highlighted that nearly 650 branches of postal payments bank may be set up in the country, and these could be linked to rural post offices. The 'India Post Payments Bank (IPPB)' is planned to have a corpus of Rs 8 billion, would be run by a CEO and be professionally managed. Indian stock markets opened the day on a flat note and traded marginally in the red at the time of writing. The BSE Sensex was trading lower by 37 points (0.14%) at the time of writing. Pharma and FMCG were leading the losses. This edition of The 5 Minute WrapUp is authored by Radhika Pandit (Research Analyst). Will More R&D Revive Pharma Stocks? Indian companies stretch their R&D budgets. Equitymaster requests your view! Post a comment on "Why Does the Government Keep Supporting Air India?". Click here! 7 Responses to "Why Does the Government Keep Supporting Air India?" It was year 2003 and I was posted in Valley as army officer on occasion of Eid I got leave to go home. As Indian army used to take planes on charter for its soldiers to go home. I was an unlucky guy after a month of Fast during Ramadaan and away from family for months together was looking forward to see my 2 year old. The air India then notorious Indian airlines aircraft arrived and we boarded the plane. The plane hummed and stopped. After 2 hours we were de-boarded and told that the plane had developed some snag which will be repaired and the plane will take off. The wait from hours turned to lengthy hours other airline planes were landing and taking off and 300 poor souls were under discipline not even to protest. There were no arrangements for food and all the shops were closed due to oncoming Eid festival at Srinagar. We shared whatever little we carried. Since next day was Eid so anxiety of likes me increased multi fold. At 6 PM airlines officials told that in absence of maintenance staff and light nothing could be done and the flight will take off next day at 6 AM. We soldiers have our own dismal arrangement of boarding and lodging where we went for the night with a heavy heart. Everybody tried to inform back home the delay in arrival but to our hard luck the Srinagar Telephone Excahnge was blown up by Militants and no mobile services existed then the ones we had was also BSNL through the same poor exchange. Next day morning everybody was woken up at 4 AM and were rushed to airport with own security procedures ad that of airport the so called CHUTTI battalion reached airport to board the plane we waited for the boarding procedure but it wasn't coming through. Minutes turned to Hours the sun was up and so I was watching My Eid prayers going up with sun it was first time I missed the Eid prayers in my life at that time in 31 years. Still consoled myself that the best moments of my Eid with my wife and daughter whose face I hadn't seen in last 6 months and ailing father still lied ahead. Planes landed and took off in front of our eyes from other airlines. Those airlines hiked their fares seeing desperate soldiers each ticket from Srinagar to Delhi Soared to approximately Rs 7800/- almost half my take home at that time. In absence of any ATM or credit card counter even that wasn't possible. Jet airways came up with two vacant seats for emergency travelers. There was a Jawan who lost his father everybody agreed to help the guy, the question came up for second vacant seat. Here the senior most officer who preached discipline all this long became true civilian and abandoned his comrades in this thick battle and disappeared in the plane in front of our eyes. Now it was almost 3 PM and on EID all shops of airport closed it was second continuous day without food the disciplined soldiers became restless there were some voices of protest and shouts to thrash airlines people and destroy the property, as officers the situation was handled quickly and no harm was done. Some civilian employees on airport duty arranged some boiled rice and boiled potatoes from their homes, but the quantity could suffice 100 odd people so it was decided as in Fauji ethos to let have juniors first. Meanwhile it was announced that a plane carrying technicians and spares is arriving from Mumbai, plane landed after � an hour there were cheers for airlines and its dedication some people hoped that the descended plane could carry back passengers. All hopes dashed when the rescuer plane took off without any passengers. Soldiers were aghast at the situation, it was told that since the airplane required preparations at Delhi for next flight and the plane is behind schedule hence the flight left (without any passengers) after another 3-4 hours I could see the sun of my joy of Eid celebrations set in the Horizon behind Icy cold mountains of Pir Panjal range. The bad announcement came at sunset that though the destined plane was repaired but couldn't took off due to dark since Srinagar airport didn't had night navigation facility for such aircrafts. Such was the dejection and despair that soldiers refused to go back to transit camp. Since we in Army cannot refuse orders, the orders were strict and firm first time in my career I had seen soldiers silent tears of despair so was my feelings inside but mustering courage we cheered up soldiers to see another day. We returned to transit camp I was called up at camp adjutant office to speak to my unit where my wife had made frantic calls through several army exchanges of my well-being in full blown militancy period of her missing husband since telephone exchange had been blown up by militants her anxiety was at pinnacle. Another bad luck fell when army exchange was out because of thunderstorm. Whole night passed sleepless for next day happenings. Again the CHUTTI Battalion reached Srinagar airport, again the same old story happened minutes turned to hours and there was no hope even that day, but the only change that no one was cheerful and hopeful, despair showed every face no shop at airport was open as celebrations of Eid continues for days at Srinagar, sill no one felt hungry and no one was speaking. With 250+ soldiers there was eerie silence not even the kind of silence that soldiers don't even follow before ambushing enemy at least there is a click of weapon then, There was occasional foot thumps as someone would go to relieve himself with long wait since morning this day there was a silent murmur that people were called to line up for boarding. There was hardly any excitement or rush as this was done many times earlier in last 3 days. Finally this time we boarded the plane at 3:00 PM the plane taxied and took off. Only change this time in flight was that there was no food only water was served and without apology even from the staff the plane landed every one rushed to the conveyor belt for luggage here again it took more than an hour since the flight was unscheduled. Everybody but still was cheerful and rushed out with small cribs but bright faces. My Eid was gone but sense of meeting my loved ones filled me with joy, seeing long queue at prepaid telephone booth I just avoided a call home thinking to make it en route. I meanwhile was looking for auto/ taxi to take me to bus terminus for taking a bus to Meerut I got an offer from a private car driver to drop me at Meerut for a charge I promised him double or pay for balance seats. The guy agreed and covered the distance in reasonably good time. Meanwhile my wife had taken the green uniform to task, who in all-out efforts made attempt to search out my whereabouts and managed to pass on news the ruckus our great airline made. I reached home in hurry and there were no stops so couldn't make calls at home (someone in such urgency will abide by me). No sooner I got to my home saw my father in law in tears who was waiting for me standing for three hours and you could well imagine condition of my wife besides him. I still remember puzzled looks on innocent face of my 2 year old daughter but happy that her Papa had come and is going to stay with her for some days and play with her. It was Eid that day for my family and an Eid to remember for me Courtesy Indian airlines (RIP). Only observations made in this incident was there was neither a word of apology from incompetent and insensitive officials of the airlines or Army who were indifferent to the incident. Nor did Army bothered to extract any cost of emotions from these people. Had this been a civil incident this would have created uproar not only in the country but internationally and the airline either would had been made to pay dearly by consumer courts or would have been trashed by its patrons/customers. This is how Army work, silently. Thanks to our national carrier every Eid I remember this incident and see my daughter grow who now is 16. Even today till the time we land the national carrier dreads us if at all we have to go by this option. It's a myth that Air India's staff/retired employees get to travel at other passengers' expense or at tax payers expense. 1. For the staff, only the base fare is waived off, he still needs to pay the fuel surcharges and the airport taxes. 2. Even after paying this, he is always subject to load, which means he will be allowed to board a flight only if there are seats available. He is given the boarding pass only after all the paid passengers have checked in and still some seats are available and will anyways go empty. 3. These perks for employees are common throughout the world for all Airlines and not restricted only to Air India. Technical failures happen to every Airline and even the best of Global Airlines have cases of misplaced baggage and delays. There have been several instances of passengers being subject to racial bias as well by the foreign airlines. Still people will anyways point fingers at only Air India , based on heresay , just because it is an Indian Carrier. I have always flown Air India all my life , and I have only had one significant delay for an international flight. I will continue to fly Air India in future. but there is no point blaming the employees. My experience with Air India has been excellend during the last four years ! Every year I travel from Mumbai to Newark and I have found their service to be excellent ! It is only that our people don't deserve it because they do not know to use the facility ! On top of running the airline inefficiently, it splurges money on its staff. Even the retired ones get to travel across the world many times in a year. The overtime & the flying bonus is steep. The normal ticket prices are kept high to enable govt employees carry their spouses free (on spouse flies free schemes), thus bleeding govt. High time the airlines is sold to pvt sector, or all the freebies for its staff & govt employees travelling on it are discontinued. I am sad to know your vow not to travel Air India. We should be proud of our national airline. It is true that politicians do not allow Air India to be privatised and keep on pumping money into it. For the last 48 years that I am travelling internationally, I was always proud to take Air India. You try other air lines which treat you badly. Neither Equitymaster, Research Analyst or his/her relative have any financial interest in the subject company. Equitymaster's Associates have financial interest in Sun Pharma, Dr. Reddy's Laboratories and GSK Pharma.